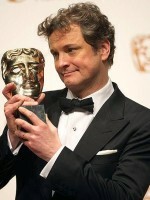 • To the surprise of precisely no one, hometown favorite “The King’s Speech” reigned supreme at the BAFTAs. • Before you go basing your Oscar predictions on the BAFTA outcome, Kris pointed out a crucial caveat. • “Inception” added another guild award to its mantel, as Wally Pfister beat Roger Deakins to the American Society of Cinematographers’ top prize. • Other Berlin attractions: a surprising triple-bill of arthouse 3D pics, and an art exhibition by one James Franco. • We interviewed the delightful Amy Adams, currently enjoying her third Oscar nomination in six years. • Also on the interview docket: 20-time nominee Randy Newman. • Our Oscar Guide continued, this week sizing up the races for Documentary Feature, Cinematography, Original Score, Sound Mixing and Visual Effects. • As always, Oscar Talk took stock of the week that was — as well as getting stuck into a certain controversial foreign-language nominee. Thanks, I’m aware of that. But life must be lived as well. Will report tomorrow.